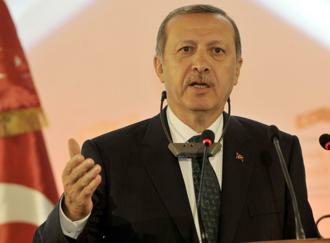 Turkey shot down a Syrian fighter jet Sunday after the warplane strayed into its airspace, Prime Minister Recep Tayyip Erdogan said. “Our F-16s went up in the air and shot that plane down. Why? Because if you violate my airspace, then from now on, our slap will be hard,” Erdogan told supporters at a campaign rally. State-run media in Syria called the shoot-down an act of “blatant aggression” and said the downed plane was over northern Syria at the time. The pilot ejected and was rescued, SANA reported, citing a military source. The Turkish armed forces website reported that two Syrian planes were spotted and were warned four times about approaching Turkish airspace as they flew north in Syrian airspace. One plane left the area but the second plane continued, and entered Turkish airspace by approximately 1 kilometer (six-tenths of a mile). The plane turned west and continued to fly into Turkish airspace, according to the site. One of the two Turkish F-16s patrolling the area launched a missile at the Syrian plane and it crashed in the area of the town of Keseb, in Syrian territory near the border, Turkish armed forces said. Syrian government forces have battled rebel fighters in Syria’s Latakia province since Friday morning after the opposition launched an offensive in the heavily Alawite populated areas of the country’s Mediterranean coast. The province is still under government control despite some pockets of armed resistance. Warplanes have been striking at the opposition in Latakia, the home province of Syrian President Bashar al-Assad, in hopes of preventing a rebel advance. One of the pitched battles on Friday occurred in Keseb, just 3 kilometers (2 miles) from Turkey. Sunday’s SANA report said the Syrian jets were pursuing rebels in the area. Syria shot down a Turkish plane in 2012, and the two sides have exchanged artillery fire in the past. In October 2012, Turkey fired on Syrian government targets in response to the shelling of a Turkish border town in which five civilians were killed. Posted on March 23, 2014, in Aviation, Aviation, Geo-Politics. Bookmark the permalink. Leave a comment.